The ATW-802 System 8 Wireless Handheld Microphone System delivers quality VHF wireless in an affordable, straightforward package that includes the ATW-R800 receiver and ATW-T802 handheld dynamic transmitter. The handheld microphone features a dynamic capsule with a unidirectional (cardioid) polar pattern, well suited for speech and vocal applications alike. The system delivers clear, natural sound quality and operates on a fixed VHF frequency band. 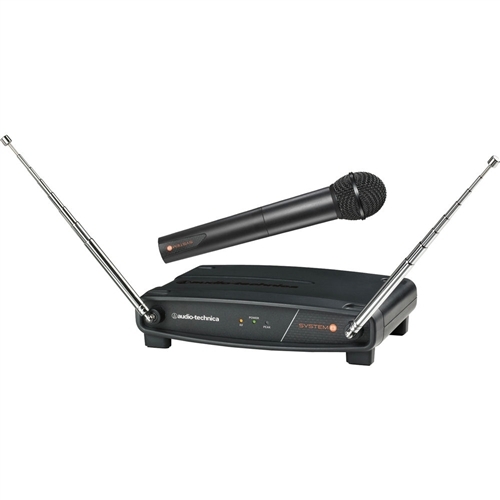 Additional features include advanced dipole antenna system for clear reception, volume control dial, 1/4" output connectors, adjustable squelch and more.